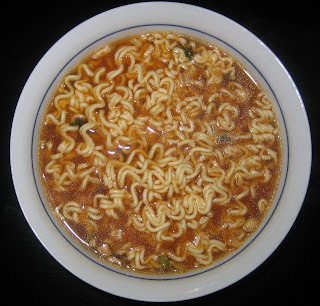 These noodles are meant to imitate the same dish as Samyang Food's KalGugSu Noodle Soup. The original dish is served with thin, flat noodles and has a shellfish based broth. I have had a lot of poor experiences with seafood flavored instant noodles, but in general, the Korean noodle manufacturers seem to have done a pretty good job. The key, in my opinion, is to stay away from shrimp and crab and stick to shellfish flavorings like clam and mussels. 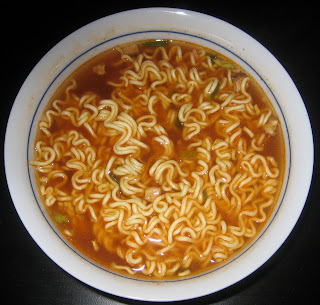 It also helps if they make the broth spicy, like Nong Shim's Neoguri Seafood & Spicy noodles. I must say that the smell from these noodles is quite strong. Even before I added boiling water, the smell of clams began emanating from the powder I poured on the noodles. After adding water, I felt like I was at a fishing pier. The broth smelled and tasted like salty clam broth. The flavor was pretty good and the disgusting factor was acceptably low. There were some floating yellow tofu strips that I thought were unnecessary. 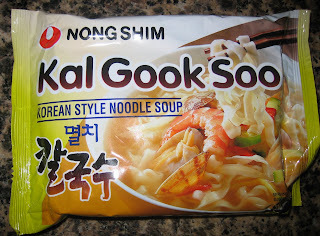 The noodles included are different from Nong Shim's typical noodles. They are wide and flat and I found that they tended to stick together more than the usual round noodles. Despite being flat, they needed longer to cook in order to fully separate and soften. Overall, they were acceptable but there was nothing remarkable about their taste. These noodles are OK if you are craving some clam-flavored broth, but my advice is just to steer clear of seafood flavored instant noodles. The Chinese character for fire is displayed prominently on the front of this package, leaving no doubt the intended flavoring of these noodles. I like this package; it conjures up a mental image of a hot coal or something else too hot to even hold. It is a little odd that the packaging proudly boasts that these noodles are now "with soy peptide". But perhaps that is not weird for the Korean consumers that these noodles are targeted towards. Without a doubt, these noodles truly pack a hot and spicy punch. The broth is cough-inducingly and sweat-provokingly spicy. As with all Paldo noodles, they are thick and chewy with not a lot of flavor. But your tastebuds will be numb anyways upon sipping the broth. The advertised "soy peptide" refers to these small vegetable protein cakes that are included. As usual, I think these things are just weird and don't taste particularly good. I really don't know why they seem to be popping up everywhere in these instant noodle packages. This is a good pack of instant noodles to pick on a cold day when you need something to warm you up. Trust me, this one will definitely warm you up although it won't provide much besides heat. I rather enjoyed it and also thought the packaging was quite fun and unique. 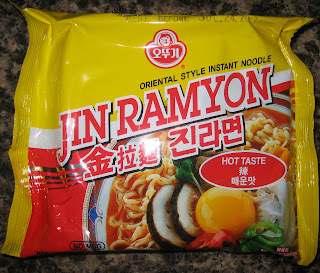 These noodles have nearly the identical packaging as Jin Ramyon - Hot Taste except that the color scheme has been changed to blue instead of red. Here, they have also used a slightly different picture that includes a couple slices of beef. The raw egg yolk is still prominently in the picture. The package also proudly advertises that this pack of instant noodles is MSG Free, which is quite an accomplishment because these things are usually full of MSG. The noodles were thick, chewy, and flavorless as I expected from trying the Hot Taste of these noodles. The biggest surprise was that the broth was a little bit spicy. I had been expecting a flavor completely devoid of heat but actually there was a pleasant peppery spice to the soup. In fact, the broth tasted quite good, combining flavors of pepper, soy sauce, mushroom, and beef. Much better than the Hot Taste flavor made by these guys. I wasn't thrilled with this pack of instant noodles since the noodles themselves are quite disappointing. However, the broth was a pleasant surprise and was definitely flavorful and savory despite having no MSG. 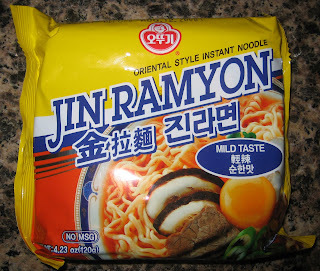 I recommend the Mild Taste much more than the Hot Taste for Jin Ramyon. I don't think I'll ever fully understand why ramen manufacturers choose to put pictures of raw eggs on the front of their packages. But Ottogi Ramyon, makers of Jin Ramyon have chosen to do just that. In Korean cuisine, it is customary to crack a raw egg into your boiling hot soup at the dinner table. In that case, though, the egg cooks immediately and doesn't sit on top of the soup looking raw. Ottogi Ramyon has very little distribution in the US and I've only seen them in one supermarket in my life. 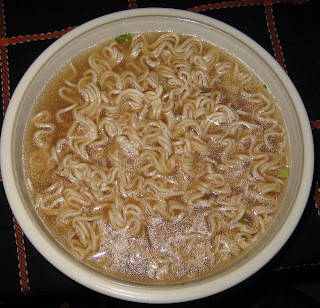 This is typical of many imported ramen, however, since it is difficult to compete with such tight profit margins on instant noodles. The noodles here were thick and chewy but lacked flavor. 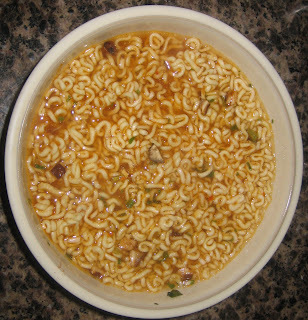 The broth was spicy, but not nearly as spicy as some of the other Korean instant noodles that I've had recently. In fact, it was a little disappointing that the broth wasn't spicier, since I had been expecting a real sweat-inducing lava soup. There isn't much that's exciting about these noodles. 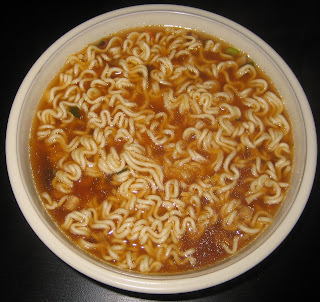 The broth is mildly spicy, but not especially flavorful and the noodles themselves are quite forgettable. 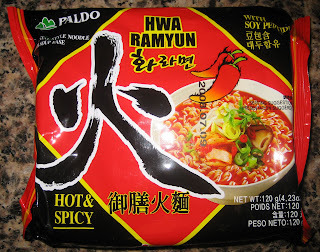 There are much better Korean spicy instant noodles so pick up another pack. I was really surprised to discover these noodles were made in the USA. I have never seen them before despite having been to countless American grocery stores and Asian markets. Finally, I found them in a Korean supermarket and decided to give them a try. Here's the website for SF Curly Pasta if you'd like to check them out, they've got some cool pictures of their ramen factory. Although these are American made noodles, they still have the description printed in 4 languages (English, Korean, Chinese, and Japanese). Maybe they plan on exporting this package to other countries. Since I picked these up in the Korean supermarket and there is a picture of two chilies on the front, I expected these to be quite spicy. Sure enough, they were cough-inducingly spicy! The flavor of the broth really reminded me of Korean instant noodles. True to their name, the noodles themselves are very curly. 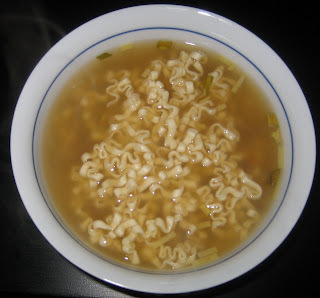 Instant noodles are purposely curly so that they can be packed tightly together, but these took curliness to a new level! I suspect that the curliness appeals to Americans who would have an easier time eating these noodles with a fork. For an Asian person eating noodles with chopsticks, the curliness doesn't make a difference in ease of eating. I enjoyed the curliness in my mouth as well, since I tended to get more flavor in each bite. This noodle soup was powerfully spicy with nice hints of onion and mushroom. 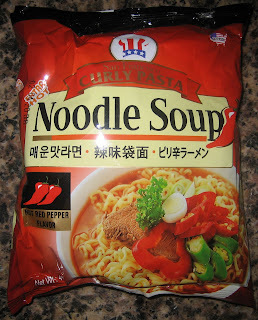 I rather enjoyed it, but to be honest, it is one in a sea of very similar spicy Korean instant noodles. Oh wait, this one wasn't even Korean, it's American! 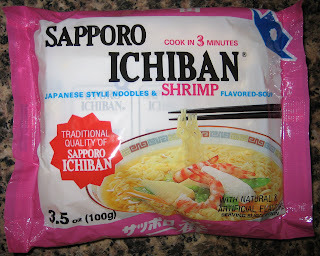 I think Sapporo Ichiban's neon pink packaging is meant to evoke the image of succulent cooked shrimp. But wait a minute, aren't shrimp more of an orangey-red color than pink? But no matter, this color helps to clearly distinguish this flavor versus the brown, green, red, or orange packets. Sapporo Ichiban has gained a strong foothold in the US and it's easy to see why. The flavors are good but still extremely conservative. The American version of the packaging has been designed not to scare away the consumer; it resembles the Top Ramen packaging quite closely. There are no "weird" things like seaweed, textured vegetable protein, tofu, or kimchi involved. I felt that the shrimp flavor here was almost nonexistent. I guess it is better than the aquarium water flavored seafood noodles that I have had before, but this one really tasted like beef instead of shrimp. Sapporo Ichiban broths always taste good because they include a healthy dose of salt and MSG (should that be unhealthy?). The noodles themselves are crunchy and have a slight onion taste to them. This was a very plain pack of noodles that was very similar to original flavor and beef flavor. For the unadventurous, these are your noodles!